Ok, so, you ordered take out last night, and they gave you a huge batch of French fries along with your ginormous burger or cheese steak. Then about halfway through your meal, you decide that there's no way in hell anyone would ever be able to eat all of that in one sitting, so you wrap up the other half and put it in the fridge for tomorrow's lunch. If any of this sounds familiar, you already know that the French fries won't be as good the next time around, am I right? The solution? Throw them into a casserole, of course! I recently had some leftover French fries and I thought "With money as tight as it is these days, why am I about to throw away perfectly good food?" It just seemed so wasteful. So I decided to do a casserole, and here it is. This is my version of a recipe that I found on another blog. It's really simple, delicious, and quick to throw together. Waste not, want not, right? Spray a 9x13 casserole dish with nonstick cooking spray. Add a little oil to a large saute pan. Roughly chop the onion, pepper, and mushrooms into large chunks. Add to the pan, and saute over medium heat. Give them a good 5-10 minutes to really cook down and begin to caramelize. In the meantime, roughly chop the French fries and add them to the casserole dish to form a layer. When the veggies are cooked, make another layer on top of the fries. Sprinkle the diced or shredded cheese over the veggies. Whisk the eggs, milk, and salt and pepper in a bowl, then pour over all. Place in the oven for about 30 minutes or until set and lightly browned on top. I used the ingredients that I happened to have on hand, but add anything you like! Any kind of green veggies would work, such as broccoli, asparagus, or spinach. Use any kind of cheese, or combination of cheeses. Add any kind of meat, like diced ham or sausage, or even ground beef. But just be sure to brown everything in a pan first before you add it to the casserole. 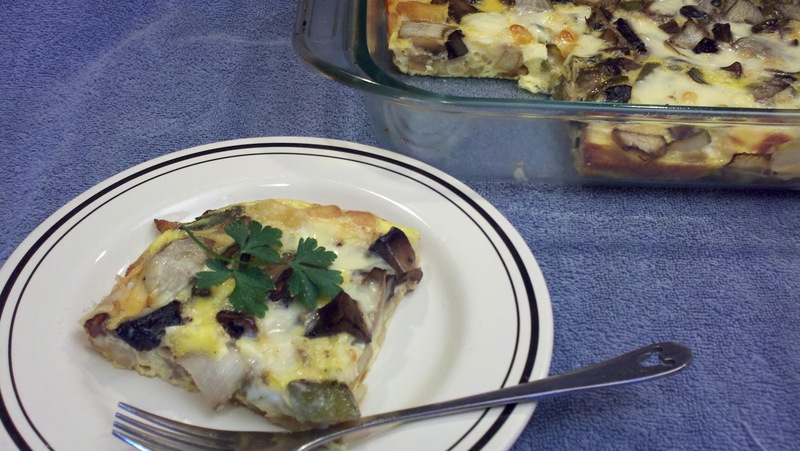 I baked this in a 9x13 dish because I wanted the final product the be thin like a frittata, but you can easily use a smaller dish. Your casserole will be a little thicker and it'll probably take a little longer for it to set up. Btw, the other blog is called Frugal Antics of a Harried Homemaker in case you'd like to check it out!